I recently enjoyed an amazing Costa Mesa staycation, making the one hour drive south of LA. 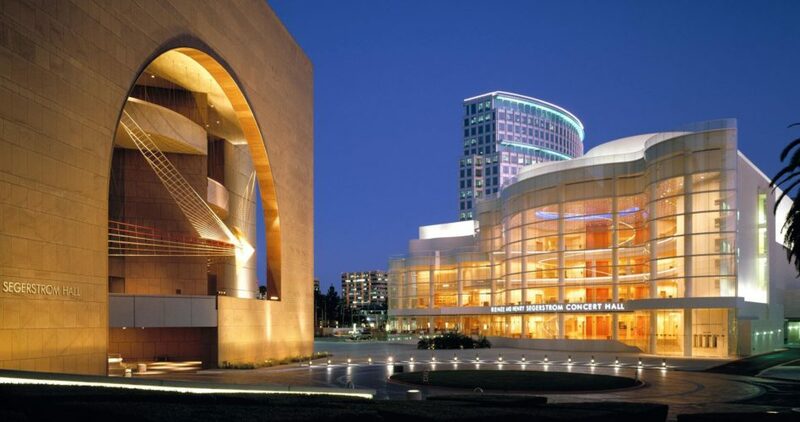 I was invited by the Costa Mesa tourism folks to explore the “City of the Arts.” I wasn’t really sure what to expect, thinking it was just another suburb of LA, but as I would soon see, I was pleasantly surprised by this surprising upscale, arts enclave. 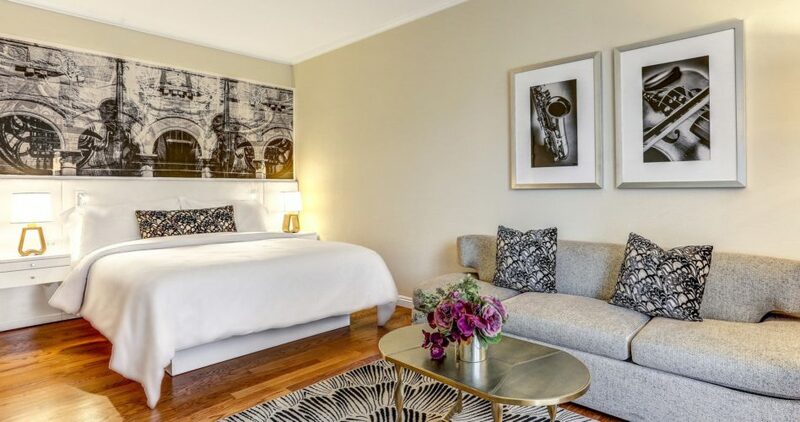 For my Costa Mesa staycation, I stayed at the Avenue of the Arts Hotel, a Tribute Portfolio property under the Marriott brand, and realized it’s the little things that hotels do that make frequent travelers like myself happy. Within five minutes of getting to my room, the concierge brought me a nice bottle of wine which was certainly the perfect way to welcome me to the hotel. But it was some of the little touches in the hotel room – actual coffee mugs, not those paper to go cups. The bathroom was colorful and stylish with floor-to-ceiling marble and a bright shower curtain. I also appreciated that the bed faced the window instead of a TV sitting on a bureau, with a small couch area that was the perfect space to work. And you know my affinity for music, so the decor was my favorite! I had a big evening planned starting with dinner at Vaca. It’s the restaurant of 2015 Top Chef runner-up Amar Santana. They’re known for their exquisite cuts of steak, but I wanted to try a sampling of different menu selections so I opted for the tapas menu. The waiter graciously made some recommendations so I went with his suggestions. He recommended I order two tapas, but being the pig I am, I ordered three! But first, I treated myself to the house drink, the Vacatonic 12 made with gin, frozen gimlet, Mediterranean tonic and basil blossoms. Yep, I’m now a gin convert! For tapas, I ordered a roasted beet salad with goat cheese and walnuts, the “house special” smoked chicken cannelloni with foie gras sauce and, perhaps my all-time favorite Spanish dish, gambas al ajillo. They were all decadent. Watching the young couple dining next to me, made my mouth water for steak so I’ll have to do that on the return trip. But I couldn’t leave without tasting another of my all-time favorite Spanish dishes, flan. It did not disappoint. So with a full belly, I took a short walk to the Segerstrom Center for the Arts or I had arranged to see The Scott Brothers House Party live show. Yes, HGTV is one of my guilty pleasures and I do love The Property Brothers. The show was cute, albeit a bit awkward and unscripted, but entertaining nonetheless. Costa Mesa is famous for its high-end shopping so a quick tour of South Coast Plaza with stores like Hermes, Christian Louboutin, and PRADA, stores I can’t afford, was in order. 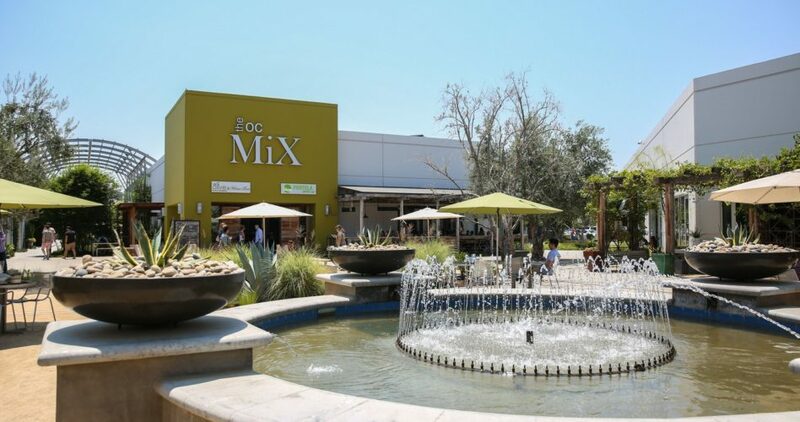 The next morning I headed to The OC Mix described as, “the ultimate design and culinary experience, with over 70 carefully curated, restaurants, showrooms and stores” for coffee at the hip coffeehouse, Portola. Definitely a place I need to get back and explore. 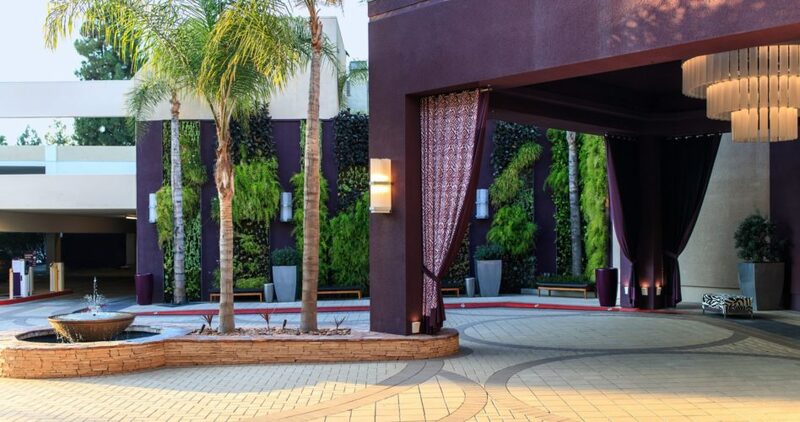 You don’t have to plan an expensive, exotic vacation to unwind and indulge – my Costa Mesa staycation was the perfect balance. The perfect staycation is all about experiencing new things that make you happy, whether it’s shopping, eating or visit a spa. Here’s how to have the ultimate staycation close to home that will feel like a real getaway. Book a treatment at a local resort spa, and often, you’ll have access to all of the hotel’s amenities including the pool, beach and guest areas. 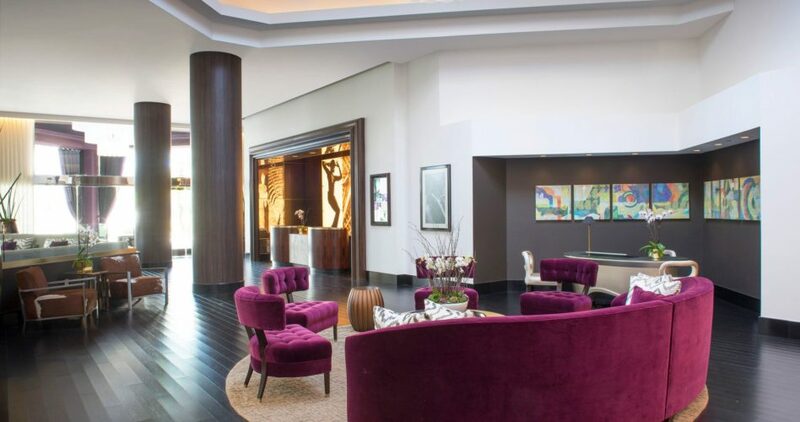 Schedule a morning appointment and take advantage of all the access in the afternoon, including poolside cocktails. Plan a night out on the town as if it were New Year’s Eve. 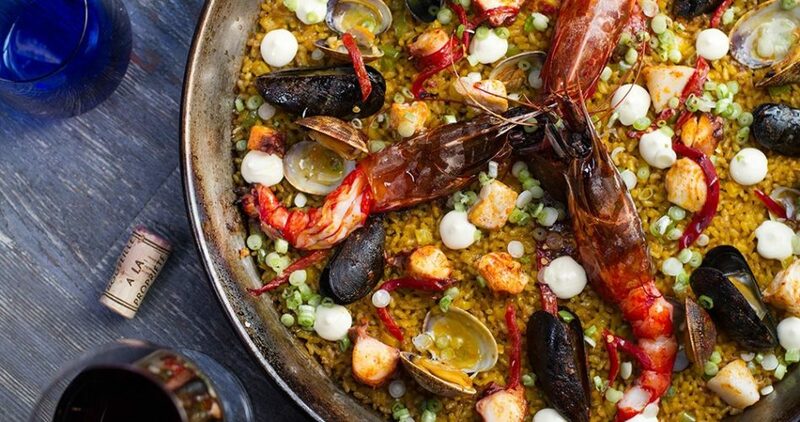 Wine bars are popping up everywhere, so start your night off at a local wine bar followed by a prix fixe dinner at a trendy restaurant you’ve never tried. Consider exploring a new ethnic cuisine, perhaps Vietnamese, Ethiopian or Moroccan food. You may have to venture to a new part of town to find it, but that’s part of the adventure, right? Check your local city magazine for the top recommended attractions in your area and make plans to visit any you’ve not seen. Also look at daytrips that are recommended by travelers and plan an entire day away. Sometimes it’s great to see destinations through others eyes. What’s the one mode of transportation you’ve never taken in your city? It could be a ferry, a touristy streetcar, a river taxi or even a kayak. Make a plan to travel to a different part of the city with the caveat that you have must go and return using this means of transport. Take a lesson in a sport you’ve never tried before, such as golf or skiing, or try out a new age activity, like meditation or tai chi. Rent a convertible or sports car for your staycation and you’ll definitely find your more playful side. Have champagne with your lunch. Imagine yourself sitting at an outdoor café in Paris and whiling away the afternoon with a glass of bubbly. Who says you have to be on vacation to drink at lunch? Be sure to document your day. See how many different local landmarks you can take selfies with.